گسل دورود به عنوان یکی از مهم‌ترین قطعات لرزه‌زای گسل جوان اصلی زاگرس از نزدیکی منطقه ارجنگ در یک روند شمال‌باختری - جنوب‌خاوری تا بروجرد امتداد یافته است. به‌منظور تعیین ناهمسانی جنبشی گسل، از تحلیل فرکتالی شکستگی‌ها، روکانون‌زمین‌لرزه‌ها و آبراهه‌ها از روش مربع شمار استفاده شد. بدین منظور محدوده مورد بررسی براساس اختلاف در توزیع شکستگی‌ها و روکانون‌زمین‌لرزه‌ها به دو بخش تقسیم گردید. ابعاد فرکتالی شکستگی‌ها، آبراهه‌ها و روکانون‌زمین‌لرزه‌ها محاسبه و سپس با یکدیگر مقایسه شده است. از روش توزیع چگالی کرنل با بررسی روکانون‌زمین‌لرزه‌ها و آبراهه‌ها در طول گسل به‌میزان عملکرد ناهمسان آن، همچنین در خاتمه با تحلیل شواهد ریخت‌زمین‌ساختی‌ها تعیین مقدار جابجایی‌های تجمعی افقی، قائم و خالص پرداخته شد. نتایج فرکتال شکستگی‌ها، آبراهه‌ها و زمین‌لرزه نشانگر بودن که بخش شمالی به عنوان پویاترین بخش گستره شناسایی شد. تحلیل فرکتالی نشان داد که بخش شمالی به عنوان پویاترین بخش گستره شناسایی شد، همچنین نتایج تحلیل کرنل و شواهد ریخت‌زمین‌ساخت بیانگر اینست گسل با عبور از واحدها با سن‌های مختلف رفتار گوناگونی نشان می‌دهد و مقادیر زوایه ریک بدست آمده در طول گسل متفاوت بوده بر این اساس گسل طبق نتایج حاصل سه قطعه با طول‌های مختلف قابل تقسیم‌بندی است، چنانچه مقدار ریک قطعات 1و2 به ترتیب °16/°126و°22/°124و طول قطعات به ترتیب 18 و 49 کیلومتراست، با توجه به بالا بودن مقادیر ریک (بیشتر از °10) مولفه شیب‌لغز تاثیر غالب‌تری نسبت به راستالغزی در این دو بخش داشته و مقدار زوایه ریک °4/°131در قطعه 3 با طول قطعه 44 کیلومتر است. "گسل دورود"؛ " گسل جوان اصلی زاگرس"؛ "فرکتال"؛ "ریخت‌زمین‌ساختی"؛ " کرنل"
The Dorud fault, as one of the most important seismicin segments of Zagros main recent fault, near the Arjng area it have northwest-southeast trend and continuity extended in Boroujerd area. This area is determined Kinematic dissimilarity fault the fractal analysis of the fractures, the center of earthquakes and drainage using the of box method, For this purpose, the study area was divided into two parts based on the difference in distribution of fractures and epicenter earthquakes. Fractal dimensions of fractures, drainage and epicenter earthquakes are calculated and then compared with each other. Kernel density method to investigate the epicenter earthquakes distribution and drainage in the long fault to rate the dissimilar activity that .In the end, the analysis of evidence Morphotectonic that long it’s to determine the horizontal, vertical displacements and net slip to be paid. Fractal analysis on Kernel density method and evidence Morphotectonic. In the end, the analysis of that long it’s to determine the horizontal, vertical displacements and net slip to be paid. So that results of fractal to indicate that the northern segment of the most dynamic segment spread to be identified. Also The results of the kernel analysis and evidence Morphotectonic indicates that neither the fault that along with passing of units of different ages show different behavior and the amount of angle Rick obtained along the fault is different according to the results achieved in three segment to different long can be divided, so that angle Rick segments 1 and2 respectively126°/16° and124°/22° and long segments respectively 18 and48 kilometer, to notice the high values of rick (more of10°) the two segments have a dominant effect of the component dip- slip relative to strike-slip but the angle rick 131°/4° in segment 3indicate of the action component strike slip that the units alluvial are plain Silakhor this segment long is 44 kilometer. "Dorud fault", "Main Recent fault Zagros", "Fractal", "Morphotectonic", " kernel"
بصیری، م.، 1390- پارینه‌لرزه‌شناسی و ریخت‎زمین‎ساخت گسل گلبافت، جنوب خاوری کرمان، پایانامه کارشناسی ارشد، سازمان زمین‌شناسی و اکتشافات معدنی کشور پژوهشکده علوم زمین، ص 173. چرچی، ع.، خطیب، م. م.، مظفرخواه، م. 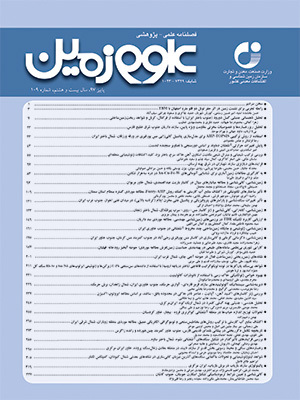 و برجسته، آ.، 1390- استفاده از تحلیل فرکتالی برای تعیین پویایی تکتونیک شمال منطقه لالی در شمال خاور خوزستان، مجله زمین‌شناسی کاربردی پیشرفته، شماره 1، جلد 1، صص. 37 تا 47. حیدری، ر. و میرزائی، ن.، 1388- الگوی لرزه‎زمین‎ساخت گسل اصلی عهد حاضر زاگرس بین 33 تا 35 درجه عرض شمالی، مجله فیزیک زمین و فضا، دوره 35، شماره3، صص. 83 تا 96. خلیفه سلطانی، ا. ا.، علوی، ا. و قاسمی، م.، 1395- بررسی نقش ساختارهای زمین‌شناسی در ابعاد فرکتالی شکستگی‌هاو آبراهه‌ها در جنوب باختری لنجان- اصفهان. فصلنامه علوم زمین، سال 26، شماره 101، صص. 45 تا 56. زند سلیمی، آ.، 1388- بررسی علل احتمالی عدم رخنمون گسل‎های تراستی و زمین لرزه های پنهان مربوط به آنها در منطقه زاگرس، دانشگاه شیراز، ص162. سپهوند، م. ر. یمینی‌فرد، ف. و جوان دولوئی، غ. ، 1391- تحلیل پس‌لرزه‌های زمین‌لرزه 11 فروردین 1385 سیلاخور (بزرگای گشتاوری 1/6) بر اساس داده‌های ثبت شده در شبکه لرزه‌نگاری موقت محلی، مجله ژئوفیزیک ایران، شماره 4، صص. 73 تا 84 . شهریاری، س. و خطیب، م. م.، 1376- تحلیل فرکتالی سیستم گسل نهبندان، فصلنامه علوم زمین، سال ششم، شماره 24-23 (بهار و تابستان1376)، صص. 32 تا 39. عباسپور، ر.، 1394- تحلیل هندسی- جنبشی بخش باختری فرازمین شتری با نگرشی بر فعالیت لرزه خیزی در گستره شهر طبس، دانشگاه بیرجند، ص 151. فروتن، م.، 1387- پارینه‎لرزه‌شناسی و ریخت‎زمین‎ساخت گسل دهشیر، پایانامه کارشناسی ارشد، سازمان زمین‌شناسی و اکتشافات معدنی کشور پژوهشکده علوم زمین، ص192. Agard, P., Omradi, J., Jolivet, L., Whitechurch, H., Vrielynck, B., Spakman, W., Monie, P., Meyer, B. and Wortel, R., 2011- Zagros orogeny: a subduction-dominated process, Geology Magazine 1-34. Bachmanov, D. M ., Trifonov, V. G., Hessami, Kh. T., Kozhurin, T. P., Rogozhin, E. A., Hademi, M. C. and Jamali, F. H., 2004- Active faults in the Zagros and central Iran, Tectenophysics 380: 221-241. Berberian, M., 1995- Master "blind'' thrust faults hidden under the Zagros folds: active basement tectonics and surface morphotectonics, Tectonophysics241:193- 224. Berberian, M., 2014- Eaethquakes and coseismic active faulting on the Iranian, Developments in earth surface processes 17: 616. Burbank, D. W. and Anderson, R. S., 2012- Tectonic Geomorphology. Blackwell Publisher, Oxford. Second Edition 474 p.
Cowie, P. A., Sornette, D. and Vanneste, C., 1995- Multifractal scaling properties of a growing fault population, Geophysic Journal International 122: 457–469. Falcon, N., 1974- Southern Iran: Zagros Mountains. In Mesozoic-Cenozoic Orogenic Belts: Data for orogenic studies (Ed. A. M. Spencer). Geological Society of London, Special Publication 4:199–211. Feder, J., 1988- Fractals, Plenum Press, New York 283 p.
Hastie, T., Tibshirani, R. and Friedman, J., 2008- The Elements of statistical learning data mining, inference, and prediction, second edition, Springer764 p.
Hessami, K., 2001- Active Faults Map in Iran, International Seismology and Earthquake Engineering Institute, Tehran. Hessami, K. and Jamali, F, 2008- New evidence of earthquake faulting in Tabriz city, NW Iran, Geoscience, 17, 1, 156–161. Leturmy, P., Molinaro, M. and Frizon de lamotte, D., 2010- Structure, timing and morphological signature of hidden reverse basement faults in the Fars Arc of the Zagros (Iran). In Tectonic and Stratigraphic Evolution of Zagros and Makran during the Mesozoic–Cenozoic (Eds P. Leturmy and C. Robin). Geological Society of London, Special Publication 330:121–38. Malekzade, Z., Abbassi, M. R., Bellier, O. and Authemayou, C., 2007- Strain Partitioning in West-Central Zagros Fold and Thrust Belt: implication for Seismic Hazard Analysis, Journal of Seismology and EarthquakeEngineering 9: 85–98. Mandelbrot, B. B., 1982- The Fractal Geometry of Nature, W. H. Freeman, San Francisco, Calif 460 P.
Mandelbrot, B. B., 1983- The Fractal Geometry of Nature. Updated and Augmented Edition, Freeman, New York ,. 495 p.
Mandelbrot, B. B., 1985- Self-affine fractals and fractal dimension. Phys. Scr, Vol. 32, p.257–260. Mirzaei, N., 2003- The most recent period of seismic activity in Dinavar segment of Main Recent Fault, Zagros mountains of western Iran, IUGG 2003, Suppro, Japan, Abstracts, P.B466. Mouthereau, F., Lacombe, O. and Meyer, B., 2006- The Zagros folded belt (Fars, Iran): constraints from topography and critical wedge modeling, Geophysical Journal International165: 336–56. Nazari, H., 2006- Analyse de la tectonique récente et active dans l’Alborz Central et la région de Téhéran: Approche morphotectonique et paléoseismologique , Ph.D. thesis, Univ. of Montpellier II, France. Peyret, M.. Rolandone, F, Dominguez, S, Djamour, Y. and Meyer, B., 2008- Source model for the Mw 6.1, 31 March 2006, Chalan-Chulan Earthquake (Iran) from InSAR, Terra Nova 20, No. 2: 126–133. Sepahvand, M. R., Yaminifard, F., Tatar, M. and Abbassi, M. R., 2012- Aftershocks study of the 2006 Silakhur earthquake (Zagros, Iran): seismological evidences for a pull-apart basin along the Main Recent Fault, Doroud segments, Journal Seismology 16: 233–251. Sepehr, M. and Cosgrove, J. W., 2004- Structural framework of the Zagros Fold-Thrust Belt, Iran, Marine and Petroleum Geology 21: 829–43. Talebian, M. and Jackson, J., 2004- A reappraisal of earthquake focal mechanisms and active shortening in the Zagros mountains of Iran, Geophysical Journal International 156: 506-526. Tchalenko, J. S. and Braud, J., 1974- Seismicity and structure of the Zagros (Iran): the Main Recent Fault between 33° and 35°N. Philosophical Transactions of the Royal Society of London., Vol. 227, p. 1-25. Turcotte, D. L., 1997- Fractal and Chaos in Geology and Geophysics. Cambridge university press. Cambridge. Vicsek, T., 1992- Fractal Growth Phenomena. 2nd ed., World Scientific, Singapore 488 p.